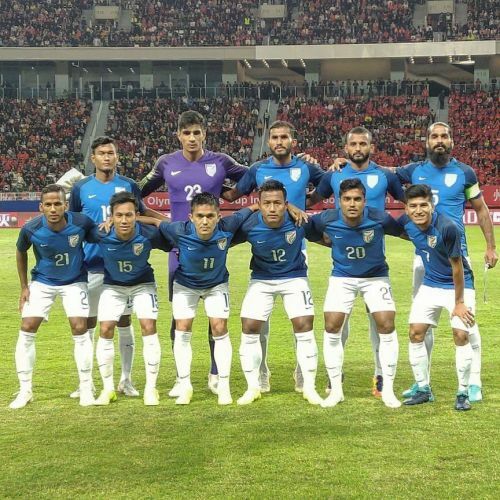 India put up a creditable performance against China to hold them to a goalless draw in a friendly at Suzhou Olympic Sports Stadium in Jiangsu on Saturday. This was India’s first ever game on the Chinese land. The two have met each other 17 times before this match, with India losing 12 and drawing five matches. When the two neighbours last faced each other 21 years ago in Kochi, China pipped India 2-1. This time, anybody could’ve won the match had they utilized their chance. 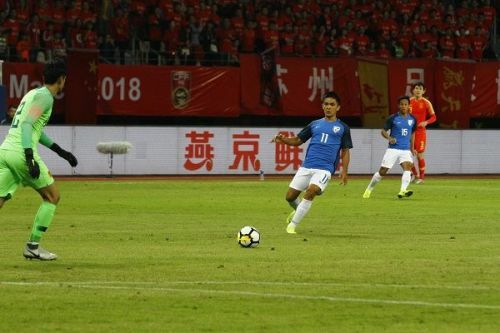 China played dominantly for the most part of the game but failed to put the ball on the back of the net. India though was quiet in their opponent’s half, but also had chances to score. Sunil Chhetri, Pritam Kotal, Farukh Chowdhary all have missed glorious chances. Considering the two teams ranking, there wasn’t much to separate. But with a world-famous coach at their helm, China should’ve won the game. India never played a higher ranked team like China in recent times. So their main objective was to earn a draw and in the end, they are successful. In recent times, India either played against a depleted side like Kenya or a team like New Zealand. The Intercontinental Cup was not a real test for the Blue Tigers. They won it comfortably beating Kenya in the final. However, as they’re preparing for the Asian Cup next year, playing higher ranked opponents seem the only option left for India. Not only that, but the recent FIFA ranking rules also say, countries will only incur more points by playing against a higher ranked opponent. In that sense, China game was an acid test for the whole team. Though India will be returning holding their heads high, there are some major points that need to be looked into. One is, of course, the poor finishing. India got a superb chance in the 13th minute when Anirudh Thapa passed the ball to onrushing Pritam Kotal. Pritam shoot on target which was saved brilliantly by China goalkeeper Yan Junling. But the placing could’ve been better, given Pritam had time to control the ball and make a shot. Another chance came when Thapa’s well-placed free-kick found Sunil Chhetri on the right flank. Chhetri made a direct shot which went well over the bar. He may blame his boots which got stuck in the field, but that’s not an excuse. Faruk Choudhary had the chance to become to the hero of the night when he got Nikhil Poojary’s pass on the third minute of added time, but his poor shot made no difference in the scoreline. India will be playing much stronger opponents in near future. So, chances like this don’t come very often. Indian strikers need to be more ruthless on the attacking third.